Because Earth's surface does not heat evenly, different parts of the world are warmer or colder than others. As we know, temperature effects air pressures, so as a result different areas of the world have higher or lower pressure than others. These temperature and pressure differences create wind patterns that occur on both small and large scales. LOCAL WINDS ARE WINDS THAT BLOW OVER AN AREA OF ONLY A FEW MILES. While they can occur anywhere, THEY ARE ALWAYS PRESENT ALONG COASTLINES. At the beach the uneven heating of land and water create pressure gradients that cause characteristic local winds that change twice each day. During the DAYTIME, the land heats up much faster than the water does. This means the air over the land becomes much warmer. The warm air creates an area of LOW PRESSURE OVER THE LAND. In comparison the water warms much more slowly. This means the air over the water is much colder. 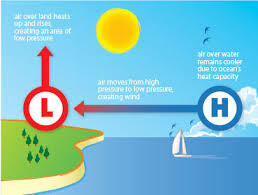 The cold air creates an area of HIGH PRESSURE OVER THE LAND. Wind always goes from High to Low pressure, so during the day the WIND BLOWS FROM THE SEA TO THE LAND and we call it a SEA BREEZE. At NIGHT when the Sun goes down, the land cools much faster than the water. This means that at night the air over the land is much colder. The cold air creates an area of HIGH PRESSURE OVER THE LAND. In comparison, the water cools down more slowly. This means that at night the air over the water is much warmer. The warm air creates and area of LOW PRESSURE OVER THE WATER. Wind always goes from high pressure to low pressure, so each night the WIND BLOWS FROM THE LAND TO THE SEA and we call it a LAND BREEZE. On a global scale wind patterns are more complicated, but they work in the exact same way. The uneven heating of Earth creates warm and cold areas on our planet. AREAS LIKE THE POLES THAT ARE ALWAYS COLD, HAVE HIGH PRESSURE. AREAS LIKE THE EQUATOR ARE ALWAYS HOT, SO THEY HAVE LOW PRESSURE. Every 30 degrees latitude, the temperature changes enough to cause the pressure to flip. These areas of High and Low pressure are called PRESSURE BELTS. Just like always, global winds WANT to travel in a straight line from High to Low pressure. HOWEVER, THE EARTH'S ROTATION AND CORIOLIS EFFECT CAUSE ALL GLOBAL WINDS TO BE DEFLECTED. IN THE NORTHERN HEMISPHERE WINDS ARE DEFLECTED TO THEIR RIGHT. Between 30N and the Equator the Wind wants to go in a straight line South. But it get's pushed to its right, so it ends up going SouthWest. This deflection of winds is called the Coriolis Effect, and it's caused by Earth's rotation. Luckily, the ESRT has a map showing us the direction of all of the global winds on page 14!!! The Coriolis Effect also causes winds to swirl around high and low pressure centers. Because of the Coriolis Effect winds around High Pressure centers swirl CLOCKWISE AND OUT! Because of the Coriolis Effect winds around Low Pressure centers swirl COUNTERCLOCKWISE AND IN!